La version anglaise des « Recommandations pour la maîtrise des phénomènes de fissuration » du Projet National CEOS.fr est désormais disponible aux éditions ISTE. This books presents the new guidelines for the control of cracking in massive reinforced and prestressed concrete structures. Understanding this behavior during construction allows engineers to ensure properties such as durability, reliability, and water- and air-tightness throughout a structure’s lifetime. 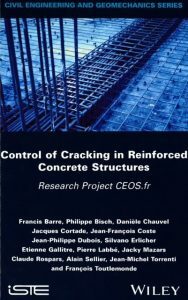 Based on the findings of the French National CEOS.fr projetc, the authors extend existing engineering standards and codes to advance the measurement and prediction of cracking patterns. Various behaviors of concrete under load are explored within the chapters of the book. These include cracking of ties, beams and in walls, and the simulations and evaluation of cracking, shrinkage and creep. The authors propose new engineering rules for crack width and space assessment of cracking patterns, and provide recommendations for measurement devices and protocols.